After surgery or illness, home-bound patients often need help reconditioning and retraining their muscles, recovering motor skills, or relearning speech or daily tasks. 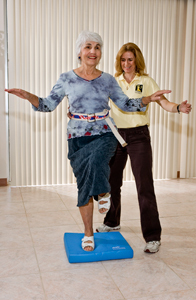 Physical therapists focus on helping patients build endurance, restore flexibility, physical strength and health. Speech therapists work with patients to regain or improve speech and communication skills, helping to retrain muscles in the throat and mouth. Occupational therapists concentrate on improving patients’ cognitive and sensory perception, as well as working on increasing confidence at performing activities of daily life. Are Avery Rehabilitation Services Right For You? Responding to this need Avery employs only the very best physical, speech, and occupational therapists trained to care for patient needs stemming from major surgery, disabling illnesses or injuries. Avery clinicians use a team approach when providing rehabilitation services to patients. Our Rehabilitation specialists work closely with your nurse and physician to develop a treatment plan, the duration of care varying depending upon condition and patient progression. Throughout the rehabilitation process all involved parties have the most up-to-date treatment records. This gives clinicians the ability to readily adjust the therapy plan to make sure it achieves the best results for the patient. All of our physical, speech, and occupational therapists are trained and licensed to meet the highest standards for their field. We work closely with in-hospital therapists to make sure that the transition from the hospital to the home is efficient as possible in order to maintain continuity of care and rehabilitation services.